the Injuns. 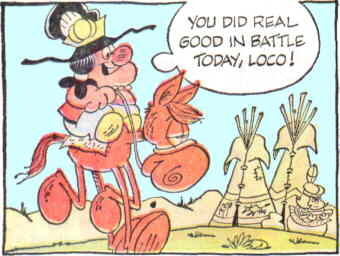 The title character is chief of the Chickiepan tribe, whose members are every bit as ludicrous as the inhabitants of 'Weeds's Grimy Gulch. Redeye is overweight and out of shape, and not very good at chiefing — but he maintains a cheerful attitude about his shortcomings, and about life in general. His wife, Mawsquaw, is better at her job, which is to raise their son, Pokey (a practical joker whose favorite victim is Redeye. and no relation), and daughter, Tawnee (who is in love with the Chickiepans' stupidest tribesman, Tanglefoot). Redeye's faithful steed's name is Loco, an indicator of his mental condition. The tribe is rounded out by a medicine man and a variety of braves and squaws. Prior to creating this strip, cartoonist Gordon Bess busied himself with magazine cartoons — starting with Leatherneck, a publication of the U.S. Marines, in which he served until 1957. After he left the Corps, his work was seen in several civilian periodicals, while he maintained a day job as art director for a greeting card company. That changed on September 11, 1967, when King Features Syndicate began distributing Redeye. Its success (not just on the newspaper page, but also, starting in 1968, in a series of paperback reprints) enabled him to live where he pleased (Boise, Idaho), and devote his spare time to recreation rather than freelancing. Bess continued to write and draw Redeye until May, 1988, when illness forced him to retire. (He died the following year.) Bill Yates (Professor Phumble, the small society) took over the writing, and Mel Casson (Boomer, Dilly Divine) the art. Yates retired in 1999, and the strip is now done entirely by Casson. Casson died in 2008, and instead of passing it to new hands as before, King decided to let it end. The last episode appeared July 13 of that year.